Not much has changed. I've started a specialty preserves company, hoping to do just that: make money grow from this archipelago's orchard trees -- a proposition I won't disagree is thick with irony. Money might grow on trees, Mom, but not the way you think. It's been a long lesson in resourcefulness getting here --the past two and a half years have been an exercise in extracting every ounce of value from a purchase, project, and especially, a vegetable. Maybe this calls out to my compulsive nature, or my desire to control everything, but parceling out every last bit of a plant into something edible or otherwise useful gives me great satisfaction. When you make something, with your very own hands, and water it, thin it, tend it with compost, surround it with mulch, train it to a trellis or tease it in the right direction over the course of a few weeks or even a few months, you cherish the fruits of your labor, the giving earth, and water, in a different way than you do groceries at the supermarket - or even the farmer's market. Naturally, I think, I've developed a respectable obsession with wasting as little as possible of what I produce -- an attitude molded by all the sweat, hard work, and dirt under my fingernails I've accumulated learning how to keep ourselves in produce year-around. And so pickling vinegar gets reused, seeds get saved and repurposed, chard stalks get finely chopped and sautéed into mirepoix, fennel fronds frozen for later use in fritters, the pollen collected for sprinkling on pork chops, carrot & beet tops get whizzed into green smoothies, stonefruit pits extracted for natural pectin and almond flavor, pea and fava tendrils tossed into pasta, celery tops stored away for broth, and nasturtium seed pods get pickled and dance around like capers. What little is left over, is a treat for the chickens, who return the favor with nourishing eggs and manure for compost. We had guests join us on the farmette this past weekend. We feasted on lamb burgers from Coffelt's spring lamb and panko-crusted haricot vert from the garden, mojo pork (also Coffelts) tacos with homegrown tomatillo cilantro crema, jalapeño cucumber tomato avocado quinoa salad, and cilantro pecan pesto tossed slaw, and sugared it up afterwards with honey stewed apricots over meringue with almond cream, and the next night, garden lavender ice cream with fresh cherry plum sauce (the sauce courtesy of our loving summer neighbors at the Royal Homestead). For snacks, I urged our friends to eat anything they like and fix up what they wanted from the fridge. The husband smirked ever so slightly and looked at me: "I don't know what anything IS in the fridge". And he had a point. My fridge is like a personal laboratory of assorted pickles, jams, conserves, chutneys, homemade ketchups, syrups, pestos, home pickled ginger, preserved lemons, and a variety of other "sauces" for tinkering. I gave up on labels a long time ago. I grabbed a hunk of cheese, and pint jar of Italian Plum Chutney and sent him happily to the bread basket. 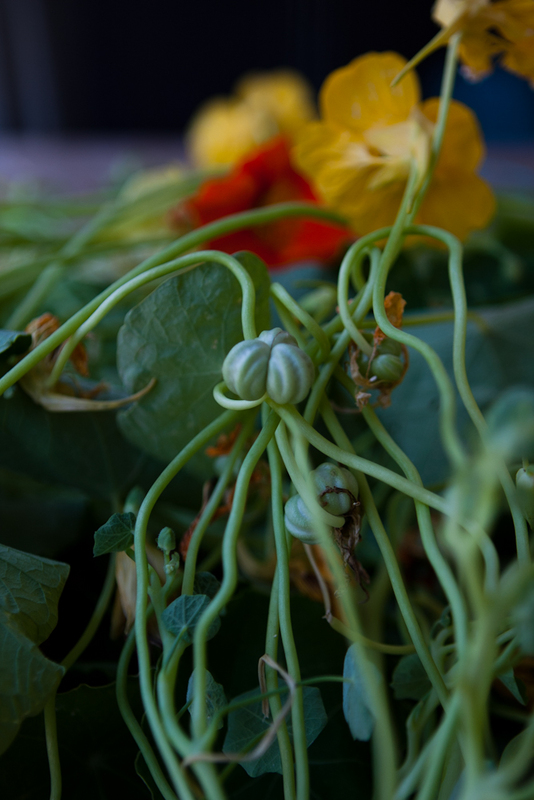 I didn't send him to the nasturtium capers, but they'd rock on an open faced vegetable sandwich, or smashed with feta, garlic and lemon juice for an impromptu dip. 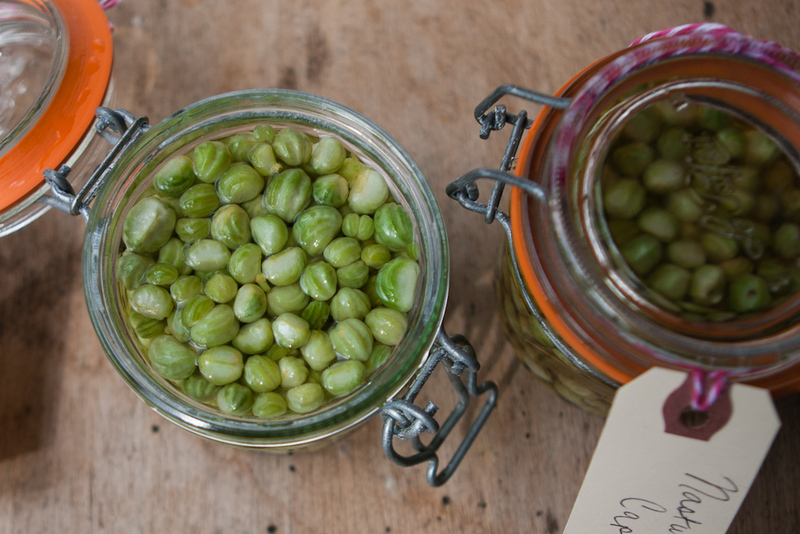 They're not really capers -- capers are the bud of a Mediterranean plant, Capparis spinosa, that loves an arid or semi-arid climate -- but they are a perfectly wonderful, local, & economical substitute. I haven't bought the real thing in two years as these keep magnificently in the fridge. 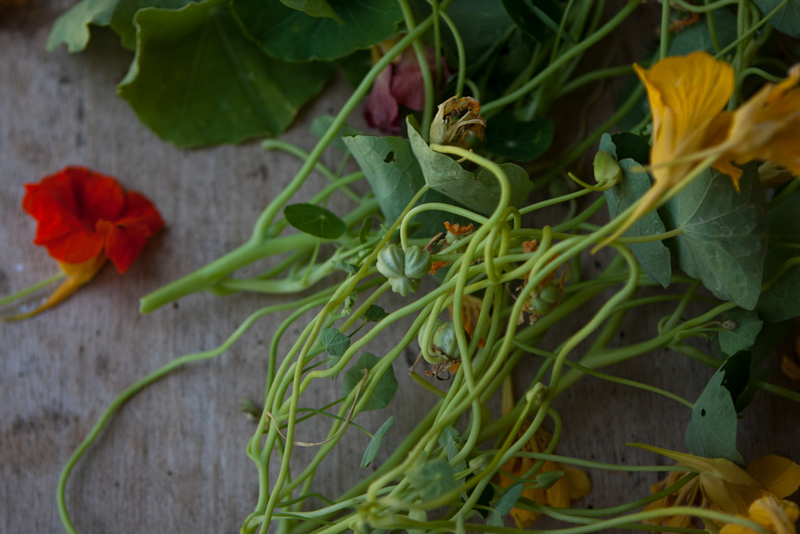 I use them just as I would capers - finely chopped into egg salad, tossed into pasta along with the jewel colored edible nasturtium flowers, crushed into a homemade tartar sauce, or straight from the jar when I need a zingy, salty kick (usually after a Jordan Almond, or candied lemon peel). And then I repeat, until sanity grabs hold of me again or a chocolate cake appears in front of me to end the battle. It's garnished with nasturtium flowers, of course. 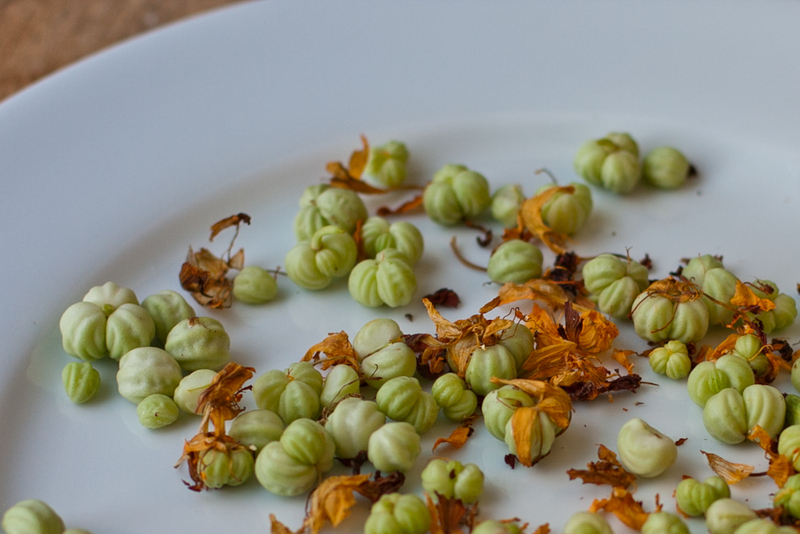 The hardest thing about this recipe is having the patience to collect all the seedpods. Think of homemade tartar sauce and carry on. Mix the water with the salt in a bowl to make a light brine. Pick over the pods, separate the ones in a little trifecta cluster into individual pods, and rinse them off. Pour them into the brine, cover, and let them sit in the salt water bath for 24 hours -48 hours. The raw seeds are quite mustardy and spicy - this helps them mellow out. After they're relaxed, drain them, but don't rinse. This is a light brine so it's not overly salty. Pack them into clean jars along with any aromatics you like (I use a few assorted peppercorns for color and a bay leaf). Cover completely with the white wine vinegar, leaving about 1/4 inch headspace. Put on the lid and store in the pantry or in the refrigerator. They will keep indefinitely in the vinegar - no need to water bath can them. I do refrigerate them after opening. Give them at least two weeks before you try them out. The longer they sit, the better.